Police said a suspect is dead today after officers shot a man whose car struck a Temple student at Broad and Oxford streets. ANGELO FICHERA | TTN. A man reportedly fled his blue truck near 20th and Harlan streets, after striking a student blocks away. According to police, around 10:30 a.m., a male driver was observed hitting parked cars with his blue pickup truck in the Rite Aid parking lot at Broad and Oxford streets, and struck a Temple student standing on the sidewalk. 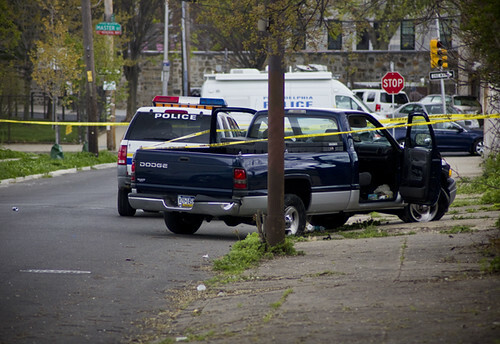 A Philadelphia Police Department narcotics officer approached the pickup truck and tried to apprehend the man, who then attempted to hit the officer, according to police. The truck reportedly struck the officer’s vehicle and the officer shot two to three times at the truck. Police said they pursued the male suspect to around 1400 N. 20th St., where the male fled his vehicle. The suspect ran across Ridge Avenue and a few vacant lots before a confrontation with police occured. The suspect allegedly said, “Step any closer and I’m going to blow your head off,” and reached for an object, at which point an officer shot the suspect once in the left shoulder and once grazing his leg. He was taken to Hahnemann University Hospital where he was pronounced dead shortly after 11 a.m., police said. According to Campus Safety Services, the Temple student who was struck was taken to Temple Hospital with severe leg injuries, which are not expected to be life-threatening. Police described the victim as a 19 to 20 year-old white male. Temple issued a TU Alert around 11:18 a.m., which said there was increased police activity around Broad Street and Cecil B. Moore Avenue. About a half-hour later, Temple sent out another alert with additional information reporting that a Temple student had been struck by a vehicle. Around 3:25 p.m., a third alert was issued reporting that police had cleared the area of investigation. Gov. Ed Rendell is taking on one of these issues, gun control, and using the other issue to do so.